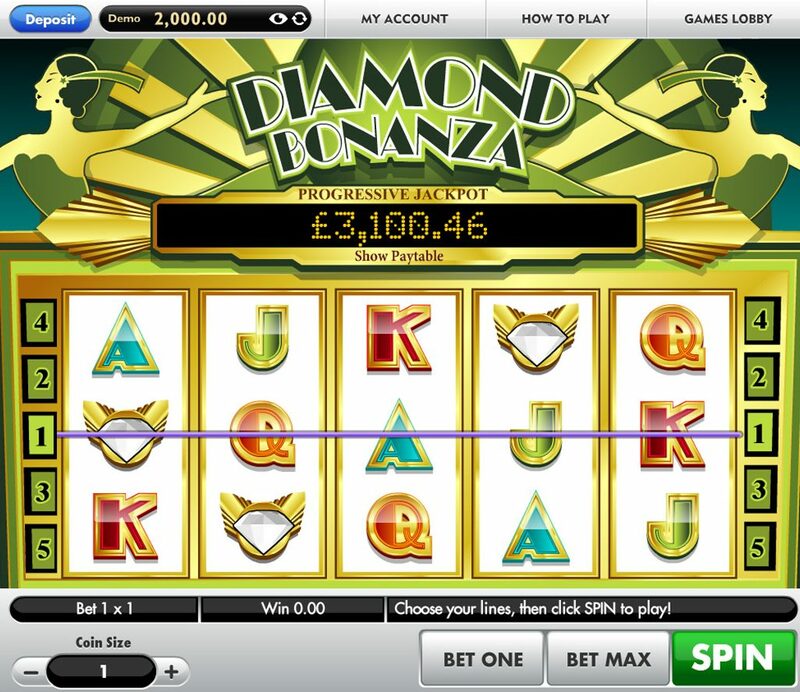 With three juicy progressive jackpots that vary depending on your line bets, and a nice roaring 20s theme, Gamesys have hit the jackpot with Diamond Bonanza. Before you start the game, you have to select which progressive you want to go for, which can be annoying if you decide to change up the stakes midway through your session, but that's nitpicking. As said, the slot has a real 1920s vibe, with lots of gold plating everywhere and Art Deco graphics on the reels. As you spin the reels a nice jazz trumpet jingle plays out. And as the reels come to a stop they clunk into place like an old one-armed bandit. You can imagine the rich and drunk of the age pulling up at their speakeasies to have a spin or three of this while knocking back G&Ts from a pipe on the wall. The one downside is that the symbols are fairly limited, so we only get Jack-to-Ace icons plus a glimmering white diamond. 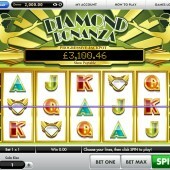 Hit five of those across the reels at the maximum bet and you'll bag the progressive jackpot. OK, I lied - the lack of icons isn't the only downside. There are also no bonus features in the game. Not one. Nada. Zilch. And with just the five paylines you can find yourself getting a few small wins every so often. Diamond Bonanza is certainly one for the old-school brigade, and that's brought out perhaps in the theme too. It brings to mind some of the early WMS online slots, and if that's not something that will make you run for the hills, check out their jewel-themed Gems Gems Gems online slot which made a successful transition from its land-based roots. Elsewhere, NetEnt's Starburst slot is well worth a play.